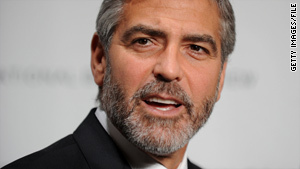 Known for his devotion to causes, George Clooney is now joining an MTV telethon for Haiti. (CNN) -- In the wake of the earthquake in Haiti, George Clooney and other celebrities have signed on for a telethon to aid the devastated island nation. The Oscar-winning actor will take part in a fundraising program to air commercial-free across several networks, MTV announced. MTV said Clooney will serve as a host in Los Angeles, while musician Wyclef Jean will be in New York, and CNN's Anderson Cooper will appear from Haiti. The two-hour event will feature as-yet-unnamed musical performances and celebrity appearances, as well as live news reports from CNN. It's Hollywood's latest philanthropic gesture in reaction to the catastrophic situation in Haiti. A celebrity lounge at this weekend's Golden Globe Awards in Beverly Hills has been turned into a Haitian aid fundraiser. Medecins sans Frontieres says actors Angelina Jolie and Brad Pitt have donated $1 million to the group's emergency medical operation as it responds to the disaster. Tuesday's 7.0 earthquake has devastated the poverty-stricken country's infrastructure. Haitian President Rene Preval said Wednesday that he had heard estimates of up to 50,000 dead but that it was too early to know for sure. Damage has closed the port and limited airport operations in the capital city of Port-au-Prince, and the quake buckled many roads, making it extremely difficult for aid groups to bring in emergency supplies and search for survivors in the rubble. MTV said all proceeds from the telethon will be split evenly among seven relief organizations currently operating in Haiti: Clinton-Bush Haiti Fund, Oxfam America, Partners in Health, the Red Cross, UNICEF and Yele Haiti Foundation and World Food Programme.